Faith Battle is a stirring spiritual guidebook that offers hope and biblical tools to strengthen your faith during these difficult times we live in. You will be compelled to examine where you stand and inspired to hold onto your faith in God. You will also be motivated to go and share the Good News of Jesus Christ. "Powerful and life changing "
People of faith are under attack in ways that we could never have imagined except for the fact that God warned us through the Bible many years ago. The realities of the "last days" are now just that: realities; and each and every believer must come to grips with what he or she believes about God, the Bible, and the future of humanity. 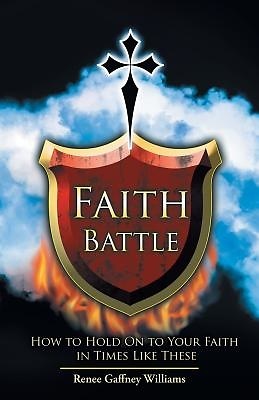 Faith Battle addresses these challenges head on, identifying all of the spiritual and cultural changes that wage war on our faith every day.